Facials have long been touted as one of the most relaxing, refreshing ways to thoroughly cleanse and tone your skin; in fact, facial treatments in Western Europe and the United States date back to the 1500s. Recently, these treatments have evolved to include a treatment known as the “back facial”. So, what is a back facial? Put simply, it’s exactly what it sounds like. The skin on your back is taken through the treatments of a regular face facial and thoroughly cleansed, exfoliated and toned. If you suffer from particularly dry skin or “backne” -acne on your back- treatments can be applied during a back facial to address those issues too, such as applications of super-hydrating moisturizers or anti-breakout serums. Why should I get one? A back facial is a good treatment for just about anyone. Even if you don’t have any obvious skin care issues, you can benefit from the thorough cleansing and care to your back. I’ve got these horrible blackheads and whiteheads on my back. Can anything be done about them? One of the reasons behind the evolution of the back facial was the address of those blackheads & whiteheads -known scientifically as open comedones. The back facial includes, as the client desires, extractions and/or steam treatments to open up and detoxify pores, and to get rid of blackheads and whiteheads as much as possible. 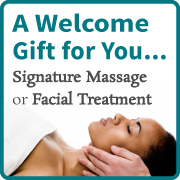 A back facial can also be a good way to introduce someone who is perhaps not completely convinced about professional skin care to the idea. While some can find an initial experience intimidating in a spa with an esthetician touching their face and shining a bright light onto them at times, back facials are often perceived as more gentle. Since the back is a less socially aggressive place to receive care, it can be a good intro for people wanting to experience a facial. Back facials are also wonderful sources of relaxation. You can just lie on the table and have your needs attended to while relaxing and taking deep breaths. Inherent to the back facial is a light massage, which feels wonderful on newly silky, newly smooth skin.